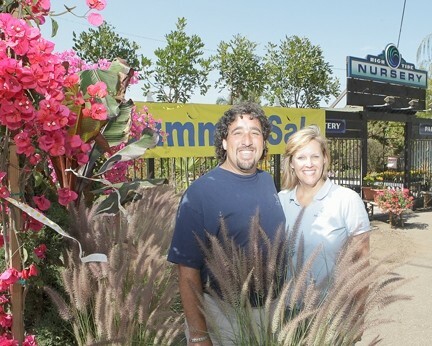 A COOLER SHADE OF GREEN : Joel and Nanci Stern offer more than just flowers at the High Tide Nursery in Shell Beach. Some things just don’t fit neatly into a single category. Overlooking the ocean on Shell Beach Road, High Tide Nursery is more than just a place to buy flowers. Given its unique floral designs and the garden sculptures and fountains, this planthouse has the look and atmosphere of an outdoor art gallery. The establishment was opened nearly four years ago by the creative husband-and-wife team of Joel and Nanci Stern and has since enjoyed a loyal and growing customer base among die-hard green thumbs looking for exotic plants and elegant garden accessories as well as those simply looking to spruce up their porches or balconies. High Tide carries a wide assortment of different species, from the common array of flaxes and lavenders to the more exotic white passion vines and dark-leaf dahlias. They are well-versed in English, Mediterranean, and Tuscan village-style gardens and offer an impressive array of fountains and garden sculptures. In keeping with their keen sense of style, High Tide’s fountains are more like fine sculptures with running water, contemporary and understated, featuring clean lines and defined shapes. The Sterns also make their own art for the nursery. Nanci is a professional glass artist, and puts her talents to use creating pieces that complement floral arrangements, such as “the Frog,” a colorful saucer-like glasswork that harnesses any floral collection, to provide a unique presentation. Another creative signature of High Tide is the purposeful breaking of a filled ceramic pot, pushing back one side and planting along the edges of the cracks, producing a rustic look reminiscent of classical ruins. Though the nursery boasts a huge inventory of different plant species, it’s found a niche in succulents. Because Joel and Nanci enjoy sharing their wealth of knowledge regarding plants—and succulents in particular—they hold seminars on succulents severaltimes a year. High Tide seems to be a natural fit for the laid-back and somewhat bohemian style of Shell Beach, but Stern also pointed out that the coastal community provides mild climate, ideal for growing plants year around. The Sterns added that as a small business starting out in the midst of an economic recession, High Tide has enjoyed the patronage of customers, friends, and the random walk-throughs from Shell Beach Road. Grateful to the local community, they have given back by participating in a number of local fundraisers, including one for Woods Humane Society. And thanks to competitive pricing, expert customer service, a cool and unique style—and such considerations as a 100 percent guarantee on their plants and the offer to gift-wrap any purchase for free—High Tide definitely is making it. Vitruvian, an Arroyo Grande-based company specializing in sustainable and eco-friendly building construction, is currently building nine homes in San Luis Obispo using Expanded PolyStyrene (EPS), commonly known as Styrofoam. According to the company, this method of green building using EPS and light gauge steel can cut up to 20 percent of the cost of traditional construction. For pictures and locations of the local homes currently under construction, and for more info, visit vitruvianbuilt.com or call 594-1785. Intern Matt Fountain wrote Strokes&Plugs this week. Send business and nonprofit news to strokes@newtimesslo.com.